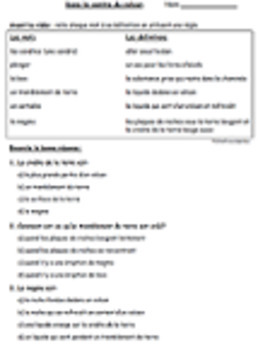 French Oral Comprehension worksheets for assessing listening skills to accompany the French science video about erosion, Tant va la roche à l'eau, from the series "Le Bus Magique" (approximately 25 minutes). Suitable for French Immersion students to reinforce science concepts of weathering and erosion. 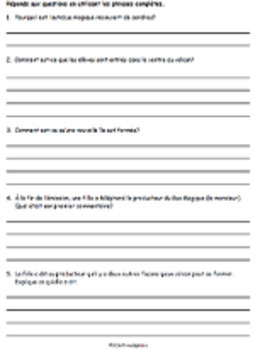 4 PDF pages: 2 worksheets and answer key. (Optional: printing two worksheets side by side on 11x17 ledger paper may be a useful alternative format). Duration of completing worksheets and viewing video is approximately 60 minutes, plus an additional 10-15 minutes to take up the answers.